The medical students often confuse two terms, Skin and Oral Mucosa. Well, today, you are going to learn the difference between skin and oral mucosa. We will explain not only the terminology but also the biological concepts so keep reading the article to stay tuned with some amazing concepts. In this article, we are going to explain the major differences between Oral Mucosa and Skin. Though both of these things are stratified epithelium, however, there are some differences which differentiate them from one and another. For example, sweat glands are hair follicles are present in the skin but absent in Mucosa, etc. Since we clearly know our objective, we shall move ahead and cover these differences. The mucosa lining the mouth is continuous anteriorly with the skin of the lip at the vermilion zone and with the pharyngeal mucosa posteriorly. Thus, oral mucosa and GI tract mucosa are continuous. The integrity of the mucosa is interrupted by the teeth to which it is attached. The oral mucosa is attached to the underlying bone or muscle by a loose connective tissue, called submucosa. The mucosa is firmly attached to the periosteum of the hard palate and to the alveolar process (gingiva). The mucosa in these regions is a functional adaptation to mastication, hence, they are referred to as masticatory mucosa. Elsewhere, except in the dorsum of the tongue, the mucosa is loosely attached as an adaptation to allow the mucosa to stretch. The mucosa in these regions is referred to as lining mucosa. The stratified squamous epithelium varies in thickness and is either keratinized as in masticatory mucosa or non-keratinized as inlining mucosa. The submucosa is prominent in the lining and is nearly absent in the masticatory mucosa. The cells that have the ability to produce keratin, called keratinocytes, undergo maturational changes and finally desquamate. The non-keratinocytes, do not undergo these changes, and they are concerned either with immune function (Langerhans cells) or melanin production (melanocytes). The mucosa that attaches to the tooth is unique, thin and permeable. The fluid that oozes through this lining into the crevice around the tooth is called gingival fluid. It aids in defense against the entry of bacteria, through this epithelium. The mucous of the dorsum of the tongue, is called specialized mucosa because it has the taste buds in the papillae. The concept of skin shall take much lesser effort for you to understand. 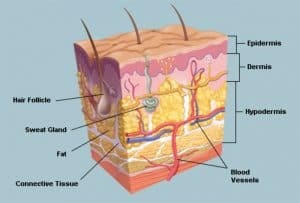 The skin is also a stratified epithelium but you must always remember that it has sweat glands and hair follicles. These structures aren’t present in the Oral Mucosa. It is of course due to the sweat glands that a liquid called sweat pours from our body. Also, the skin is an outer covering on the human body. The skin of the animals is quite different from human skin. As far as the human skin is concerned, it is comprised of several layers of tissues called ectodermal. The skin of humans is quite similar to those of other mammals. So this was our complete account of the difference between Oral Mucosa and Skin. Keep visiting our website in the future to clear your confusions.